One of the nice things about cleaning up your garage is that you can spread out into the driveway to sort through your belongings, so pick a nice weather day to tackle this project. Move vehicles out to the street to give yourself plenty of space and start early in the morning so you can finish (hopefully!) in one day – your neighbors probably won’t appreciate your things decorating the street for too many days. Begin with the big items – anything old that is waiting to be repaired and hasn’t been for more than a year or two can probably go. Repair shops might even exchange your broken items for services on pieces you want them to fix. Have the kids sort through their toys and see if any have been outgrown. You can donate the toys or take them to a resale shop – you’ll likely get a good price for bikes, scooters, soccer goals and anything motorized. If you have a bicycle or other active gear, consider when the last time you used it was and if it is worth keeping. Some things may be hard to part with, but as a general rule, if you haven’t used them in two years, you can part with them. Next, shift to the smaller items. These are the ones that tend to take up the most space, surprisingly. Getting a storage container with drawers is a great way to keep gardening and other tools organized. Put nails, screws and other hardware in smaller drawers near the top (kitchen utensil holders work great for this purpose!) and bigger items like power drills and electric screwdrivers in the bottom. Gardening spades, gloves, and hand rakes can also go in the drawers. Sort your garage items by type or use and label every bin and drawer for easy location later. A wall storage unit in the garage can also come in handy. A simple wire rack system with plastic bins will suffice, but there are fancier models available. Custom built garage storage is also an option if you’re willing to spend the money and/or have an awkward-shaped space. Hanging racks that will hover above a parked car can maximize use of a small space. Use hooks in the ceiling to hang lawn chairs or bicycles upside-down. Pre-built garage storage units can be delivered from your local home repair store and most have wheels on the bottom for easy moving, just be sure to lock into place. Pegboards and hooks directly into the walls or on the sides of shelving units are a great place to hang shovels, rakes and hoses. 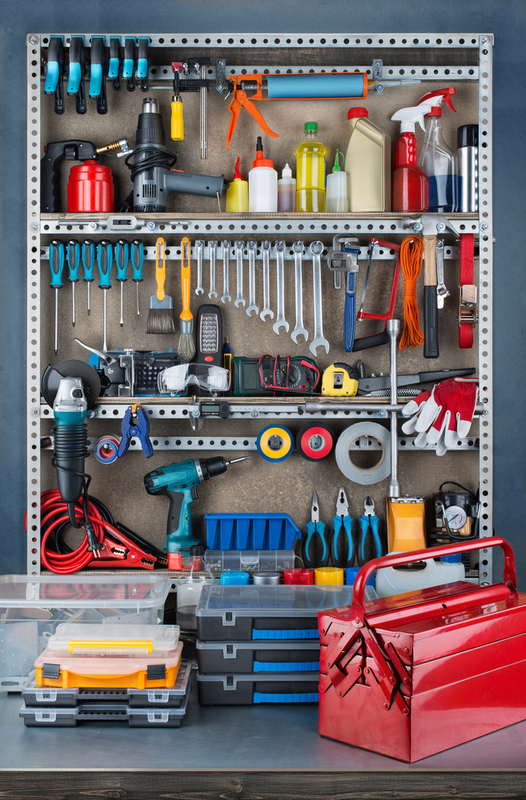 Pegboards also score points for their flexibility to manage items of different sizes and re-arrange with ease.